Take Licorice Root For Lingering Symptoms Of The Flu. You Haven't Time To Wait For The Next Widely Heralded Anti-Viral Drug. Take Licorice Root For Lingering Symptoms Of The Flu. You Haven’t Time To Wait For The Next Widely Heralded Anti-Viral Drug. Licorice root extract is your best bet to quelling lingering bouts of the flu but you aren’t likely to hear much about it. Every year the Centers for Disease Control working in concert with vaccine makers creates undue public fear over influenza-related deaths to panic people to undergo flu vaccination. The news media follows along and reports thousands of deaths from the flu, but according to a report published in the British Medical Journal, deaths of aged adults due to pneumonia are combined with the flu to make it fasely appear the flu is a widespread killer. Investigative report Jon Rappoport could only come up with 20 flu-related deaths a year when he delved into the topic. Rappoport has authoritatively uncovered this public hoax three years in a row but the over-cooperative news keeps the Centers For Disease Control (CDC) fear campaign going. Actually Rappoport first exposed this giant lie in 2014. Fake flu news was rampant long before fake news became a public issue. And unashamedly, it continues on today. 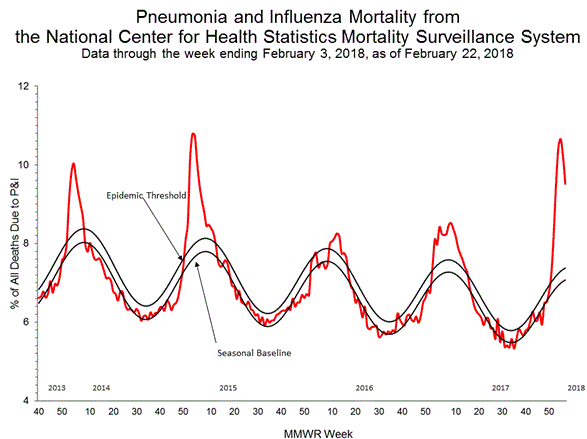 But a chart issued by the CDC shows the flu season had peaked and was already steeply headed downward (see chart below). While you are waiting for the next widely heralded anti-flu drug to become in the U.S., you might want to reach for licorice root extracts, which are documented to quell flu viruses better than vaccines. Given that flu vaccines only address two or three strains of the flu and by the time they become available for each flu season and the flu virus in circulation has mutated into other strains, this self-limiting effect of flu vaccines makes flu vaccines largely ineffective before they are even employed. Flu vaccines still remain limited in their ability to prevent or at least dampen symptoms of influenza. There are anti-flu virus drugs (Tamiflu, Relenza) that are problematic in themselves (they induce treatment resistance), but now a new drug is about to enter the marketplace. The new drug, Xofluza (baloxavir marboxil), has been approved for use in Japan and is said to knock out the flu in just one dose. Xofluza works by inhibiting replication of the flu virus and works faster than Tamiflu or Relenza, enzyme inhibitors (neuraminidase inhibitors) that liberate flu viruses from the surface of infected cells. While Xofluza halts flu virus replication it doesn’t completely eliminate symptoms immediately. While not side effect-free, it is considered an advancement over existing flu medications. The claim Xofluza “kills the flu virus in a single day” is specious because viruses are not living organisms, they are globs of genetic material (RNA, DNA) that infect a host cell and replicate at an extraordinary rate. You won’t likely hear about licorice root for the flu in news reports largely because news outlets are bought-off by commercial interests today. And if you do hear about licorice root, the reports will likely be slanted to frighten consumers away from alleged side effects such as high blood pressure which only occur when misused and overdosed. Glycyrrhizin (or glycyrrhizic acid or glycyrrhizinic acid) is the chief sweet-tasting constituent of licorice root (botanical name: Glycyrrhiza glabra). It is used in small amounts as an emulsifier and gel-forming agent in foodstuffs and cosmetics. Licorice root’s principal anti-viral ingredient is a natural sweetener and is about 50 times as sweet as table sugar. The main active anti-viral ingredient in licorice root, glycyrrhizin, works by inhibition viral gene expression (protein making) and replication. Gee, that sounds like Xofluza! In 1979 a report published in Nature magazine documented that licorice root inhibits growth of several types of viruses. The commonly used anti-viral drug, acyclovir, leads to viral resistance. Licorice root induces no viral resistance. A report published in the journal Planta Medica notes that licorice root is an effective anti-influenza agent that is similar in its ability to inhibit the neuraminidase enzyme, a same biological action as widely used flu drugs Tamiflu and Relenza. The drawback of licorice root is that it elevates sodium and reduces potassium levels over the long term and high doses may induce high blood pressure. Licorice root: what is a safe dose? When four graduated doses of glycyrrhizin (108, 271, 380 and 814 mg/day) were given to human volunteers for 4 weeks, no adverse symptoms were reported at the two lower doses and headaches, but high blood pressure and low potassium levels forced some individuals to withdraw from use at the two higher doses. In another study, women were given licorice (1, 2 or 4 milligrams of glycyrrhizin per kilogram of body weight per day or 70, 140 and 280 milligrams for a 154-lb. adult) as they are deemed to be more sensitive to the effects of glycyrrhizin than men. So at 2 milligrams per day (140 mg glycyrrhizin) no side effects occurred. Just to be on the safe side and a ten-fold lower safety factor was established of 0.2 milligrams per kilogram of body weight, or 14 milligrams of glycyrrhizin. But in practice, no side effects occurred at 140 milligrams. Search on the label of licorice root capsules to determine just how much of the active ingredient (glycyrrhinic acid) is in each pill. When human volunteers were given 50, 100 or 200 grams of licorice candy per day for 4 weeks that provided 75, 170 or 540 milligrams/day of glycyrrhizinic acid, within two weeks there was a rise in blood pressure in all dose groups but the increase was only 3.1 mm Hg in the lowest dose and this elevation normalized by the 4th week of the study. But maybe your adrenals are exhausted and that’s why you came down with the flu or a cold virus in the first place. Cortisol is the primary stress hormone secreted by your adrenal glands. If cortisol levels go too low or too high, this can lead to regular infections, chronic inflammation, autoimmune diseases or allergies. Licorice root boosts adrenal hormone production. Also be aware, high-dose glycyrrhizin (240-255 mg) has also been reported to cause a drop in male testosterone levels. But you are not going to use licorice root every day, just for a short course to help battle a head cold or the flu for a few days. So this should be of little concern to males. Licorice root extracts are approved for use in some over-the-counter drugs. The US Food & Drug Administration limits licorice to 0.5% glycyrrhizin in dietary supplements. Glycyrrhizinic acid at a dose of 100 milligrams per day “would be unlikely to cause adverse effects in the majority of adults, recognizing a subset of the population may be more susceptible to its physiological effects even at lower doses.” The European Community’s Scientific Committee on Food has established 100 milligrams of glycyrrhizinic acid to be a reasonable upper limit of consumption. Both licorice extract and glycyrrhizin are approved for use in foods by the U.S. Food and Drug Administration (FDA) and the Council of Europe as well as the Joint FAO/WHO Expert Committee on Food Additives (JECFA). Licorice has also been included in the list of substances Generally Recognized as Safe (GRAS) by the Flavor and Extract Manufacturers’ Association (FEMA). Current estimates for intake of licorice extract and glycyrrhizin in the United States are in the range of 1.6–215 mg/day (as glycyrrhizinic acid). Licorice root should probably be avoided by individuals taking digoxin for heart failure, or steroidal anti-inflammatory drugs (prednisone), and individuals with high blood pressure. No one mentions that supplementation with potassium would balance out the hypertensive problem posed by licorice. Bottom line: keep a bottle of licorice root capsules handy for use when flu viruses or any other type of virus erupts. De-glycyrrhizinated licorice (DGL) has been manufactured to avoid the high blood pressure side effect of licorice root by removing the active compound glycyrrhizin and is available as a licorice lozenge for the treatment of gastric ulcers. Deglycyrrhizinated licorice (DGL) is safely used to promote healing from gastric ulcers. In the 1950s researchers employed 10 grams (10,000 milligrams) of licorice root powder to successfully induce disappearance of some gastric ulcers and diminishment of others though some patients reported headache, dizziness and high blood pressure. The anti-ulcer drug carbenoxolone is a synthetic analog of glycyrrhizinic acid. Many people experience flu symptoms (fatigue, body aches, chills, cough, sore throat, fever) for reasons other than the flu. Among common causes of flu-like symptoms are enteroviruses. Enterovirus 68 and 71 outbreaks have been widely reported in the US in recent times. Except for polio, there are no available vaccines against enteroviruses. Many people are infected by enteroviruses but never experience symptoms. There are no proven drugs against enteroviruses either. Garlic (allicin) is one natural remedy that exhibits anti-enteroviral action. Some drugs may induce flu-like symptoms, like the injectable pain reliever etanercept (Enbrel), a tumor necrosis factor (TNF) inhibitor. TNF is an inflammatory agent in the human body. But TNF is also part of the immune response. Over-inhibition of TNF can induce vulnerability to infections and flu-like symptoms. Overdose of polyphenols like resveratrol can inhibit TNF and produce flu-like symptoms also.